St Mary Redcliffe was described by Queen Elizabeth I in 1574 as "the fairest, goodliest and most famous parish church in England," and who are we to disagree? There has been a church on the site for over 800 years, but most of today's building dates from the 15th century. The exterior is all soaring verticals with an enormous spire, crockets, lacework tracery, flying buttresses and huge windows. Much of the medieval decoration, such as the rood screen, was lost during the Civil War and Commonwealth after good Queen Bess' comment. However, there has been work done on the building in every century following to add interest to this place. The interior, with its vaulted roofs and painted bosses (over a thousand of them, many of them gilded), is still magnificent. The spire that is such a feature today was only a stump for most of the building's life; it had collapsed in 1446 and was only replaced in 1872. 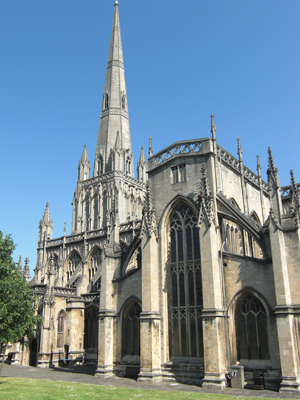 St Mary Redcliffe is the largest parish church in this major UK city. It is only one kilometre from the cathedral, but maintains links with the city and its life in a way that many other cities would reserve for the cathedral. This may be because Bristol and St Mary Redcliffe established links before Henry VIII created the diocese of Bristol and made the former Augustinian abbey its cathedral. The service we attended was an example of these ancient links. St Mary Redcliffe stands beside what has become a busy roundabout on the edge of the city centre close to Bristol's floating harbour (a lock-sealed offshoot of the river Avon that provides an inland port) in one direction, and the main railway station in the other. The streets close by hold the Bristol General Hospital, as well as some modern housing and office developments. The commercial and retail heart of the city is but a short walk away, but Bristol being an ancient place, one passes several other churches en route. The Revd Dr Simon Taylor, priest in charge; the Revd Wendy Hough, parish missioner and chaplain. There were also other clergy whose names were not given. In attendance were the Rt Hon. Christopher Davies, Lord Mayor of Bristol, as well as the city treasurer, chief executive, and other dignitaries. The event was ticket only, but there were a few places untaken around us. The building is of generous proportions, so it still meant that about 500 were present. There was a big throng at the door as we arrived, with several stewards around (all with red carnations in buttonholes, many in tailcoats) but we obviously looked too confident and interested in the building and the rushes on the floor to need assistance or special welcome. A formed wooden seat on a stackable metal frame. It proved surprisingly comfortable, probably more so than the pews which lined the centre aisle. Busy. We arrived rather earlier than intended, but the place was still buzzing when we got there. There was a choir practice in progress, coordinating with the brass band. Friends were greeting each other and chatting, stewards were showing people to their (ticket-assigned) seats, the brass band played merrily after the practice, and finally the organist took over to play suitable soothing tones. It was fun watching on the video screen in place for the day (see more below) as people arrived. A 19 page booklet specially produced for the occasion, of which two pages were dedicated to the order of the processions in and out. The booklet had all the words for the hymns and psalm, creed, collects and prayers, plus information about the history of the Rush service. An electronic organ by the Makin company of Shaw, Lancashire, was pressed into temporary service whilst St Mary's pipe organ is undergoing restoration. There was also a brass quintet for the day (two trumpets, French horn, trombone and tuba). The robes! The hats! This was the great and the good of Bristol in all their finery. The councillors and aldermen were in long red robes with black trimmings with black tricorne hats (removed of course inside the building). The ladies in the church were not to be outdone, and there were more hats in church than I have seen in many a long year. As some of those were "fascinators," with bits bobbing around as the head moves, it was quite amusing, not to say distracting. Rather formal. The ceremony has changed little down through the centuries. The dignitaries processed around the churchyard in their scarlet robes and then across the carpet of rushes to their pews. The service itself was very challenging musically: Bernard Rose's Preces and Responses were wonderful; the Jubilate was Herbert Howells' Collegium Regale setting; the anthem was a modern (i.e., dissonant) version of "Come Holy Ghost" by Andrew Carter. All that, plus four hymns, the psalm, and the National Anthem in conclusion. 9 – The priest in charge spoke clearly in tone and idea and made good points for his listeners without being condescending or too technical. He spoke from notes, but his delivery was fluent. He began with a joke and then went on to use it as an illustration of "The Big Sort," a concept by Bill Bishop, an American author, that we increasingly tend to live, work, socialise and worship with people who think like we do. But differences are important. In the first lesson (Gen. 11:1-9, the tower of Babel), we see that God confused man's language so that all men would not be the same. In the second lesson (Acts 2:1-11, the coming of the Holy Spirit and the speaking in tongues), we see that everyone remained different even though they could all understand what was being preached. Our differences are God's gift to us. We should enjoy them, whilst learning to live and work together. Pentecost brings us together, but keeps us distinct. The choral music (yes, I am a singer, so that is no surprise). Here is a parish church (a special one, but still a parish church) that is within a mile of a cathedral, that manages to maintain a boys-only top line choir that sings some very demanding music. There were several large video screens positioned in the side aisles so that all could see what was going on outside before as well as inside during the service. Unfortunately, there was a quarter second delay in the video signal, so you heard the words, then saw the speaker's mouth move. When the camera was on the choirmaster, he was behind the beat! I had consciously to not watch the screens during the sermon, as it got so irritating. Most people didn't stay to listen to the organ voluntary, but headed for the south door. Everyone looked fairly lost. As has been the custom since the first Rush Sunday 515 years ago, all of the dignitaries received a nosegay before processing out. This, too, has changed little since 1494 – some traditions are very good! William Spenser had provided in his will for the Lord Mayor to serve sherry and cakes to the congregation. Tables were set up in the bright sunshine in the churchyard, well stocked with sherry, orange juice and wine. I don't believe coffee was available, though. 8 – Not easy to judge from this exceptional occasion, but the ceremonial and music seemed to fit our comfort zone. Yes. Bristol is one of the major cities in the UK, and to see an ancient church-going and preaching custom maintained and a thought-provoking and challenging sermon delivered is encouraging. The smell! The rushes on the floor and the flowers in nosegays for the ceremonial guests made an overwhelming scent as we entered the church. One got used to it during the service, but we noticed it again when leaving.